Adeyemi Adediran transferred to Syracuse University from a university in his home country of Nigeria in 2014. A philosophy major, he won that department’s Peterfreund Prize for undergraduates this past summer. He spent the summer volunteering at a community center in Baltimore, where he now lives. 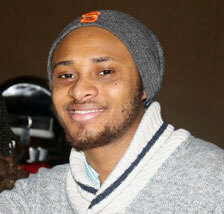 He also interned at two law firms while he was a law student in Nigeria. How did you end up coming to Syracuse University? I often tell people that I ended up coming to Syracuse because I watched a movie, “Elmira Express,” which tells the story of the famous Ernie Davis, but I am not quite sure how true this is. Funny enough, I cannot quite put my finger on the exact time I decided Syracuse University was the right fit for me. I applied to about six other schools last year, and I was accepted to most of them. I probably made the decision to attend Syracuse University because of its proximity to New York City, a place where I hope to eventually practice law. I have met a lot of wonderful people here, students and professors alike. Two of my professors have been particularly great to me: Professor John Robertson and Professor Kenneth Baynes. Syracuse holds a special place in my heart because I have managed to maximize my potential here. My time in the university in Nigeria was fraught with crisis because of my activities as a student activist. I spent more time organizing within the student movement than I did in class and I have always felt like I did not reach my full potential academically. However, here in Syracuse, I feel like I am finally attaining the heights I have always felt I could reach, and I feel that the nature of the academic system here has made that possible. I have been truly amazed by the desires of many professors to go out of their way to help and make their students better. That is what education should be all about. What is the Peterfreund Prize, and how did you win it? The Peterfreund prize is given to any junior deemed to have shown the greatest potential for philosophical achievement during the senior year. I was home over the summer when I was informed that I had won this year’s prize. I was nominated by one of my professors whose class I took in the spring this year. The general criteria for the prize include the ability to write philosophical arguments skillfully and a mastery of philosophical concepts. My professor nominated me and presented a couple of the essays that I wrote for his class as supplements. What other activities do you participate in at Syracuse? I am the curriculum director for Making Expression and Scholarship Heard, an organization that teaches creative writing to Middle School students in the Syracuse City area. I also work as a grader in an “Ethics in Computer Science and Electrical Engineering” class. What does the future after graduation hold for you? I intend to go to law school. I have always wanted to be a lawyer. Circumstances forced me to abandon my law degree in Nigeria. I had less than a year left to graduate and eventually write the bar exam in Nigeria before I left. So, in the next year I should be in law school. I recently decided that I wanted to attend business school alongside law school, but I might have to change my mind about that; I am beginning to realize that I have not gotten over my phobia for mathematics, so the business school plan might just be shelved.